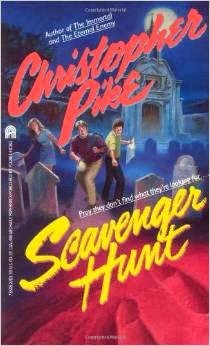 Was a huge Christopher Pike fan when I was a teenager. Recently, I decided to go back and re-read some of his work to see how it holds up. I started with Scavenger Hunt because I remembered it the least of all the books on my shelf. Happy to say that Pike's work holds up very well. Except for the lack of cell phones, the book doesn’t feel dated at all. He still offers great characterization of teenagers/young adults. The story is fast-moving and tense with a couple of good scares and some creepy bits. Falls short for two reasons. First, there’s a muddled bit of plotting in the middle where the characters just realize things spontaneously. And, secondly, the ending was a little flat: a tad heavy on the new age feel and too much expository dialogue to info-dump toward a neat conclusion. But, overall, was a really fun read and everything I remembered/wanted his work to be.